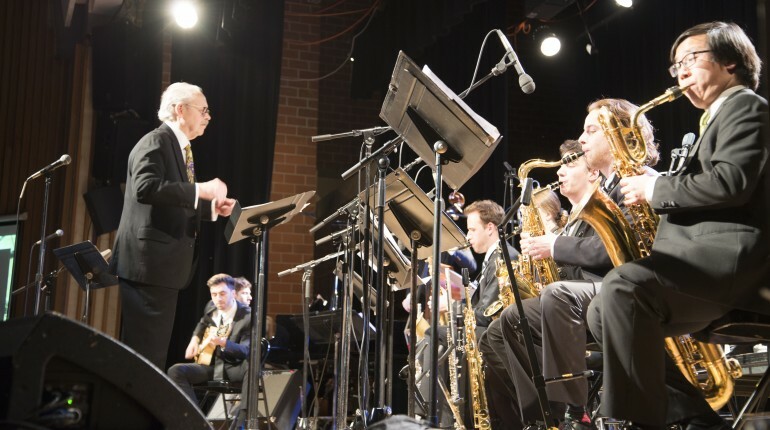 None of Denny Christianson’s students — or anyone in the audience — suspected the Spring Showcase at Lakeshore campus would be his last performance as music professor. The annual event was used to give a surprise goodbye as he announced he’s retiring from being a music professor at Humber College. Christianson joined the music program 17 years ago when he saw a posting from Humber who was looking for a new music professor. The Juno winner recorded with greats like Ray Charles, Smokey Robinson and Diana Ross. After a successful career as Humber Studio Jazz director, he would use the showcase to say farewell. The Spring Showcase started when Steve Bellamy, the Dean of Creative and Performing Arts, introduced Christianson and announced it would be his last performance. Then the orchestra started the night with the song “In a Mellow Tone” by Duke Ellington. The special guest of the night, saxophonist Pat LaBarbera, was introduced to play with the band the classic “Norwegian Wood” by the Beatles. He showed his talent leading the younger musicians with his sax and precise notes. The band also played a non-instrumental song named “Just Squeeze Me” by Duke Ellington with vocals by Alisha Oliver. The music program student said she loved what she and Christianson did when collaborating. “Denny started with swing and I love swing music too, so I loved how the collaborations of old swing and modern jazz were,” Oliver said. During the two-hour long concert, the Ensemble did not limit itself to only one musical genre. The group moved from jazz to swing to classic rock and even embraced Cuban jazz. “My musical influence is too diverse, Jazz is a huge part of my foundation, specially Miles David but classical music is huge part too,” Christianson said. When the musicians interpreted “Oleo” by Sonny Rollings and “Manteca” by Dizzy Gillespie, the crowd became more animated by singing quietly, but joyfully, along. The arrangements made by Christianson and the orchestra clearly demonstrated the kind harmony between him and his students. To finish the showcase the Humber Studio Jazz Ensemble interpreted “Love for Sale” by Cole Porter. It would be the last song Christianson would play for Humber. Christianson is a genius who knew a lot about music, said Oliver. “We had a lot fun collaborating together and making music for this show. He is really nice too, he is really conscious on how I feel as a performer, so yeah, he is very great,” she said.